Both the plantar fascia and the Achilles' tendon attach to the calcaneus. The connections are separate in the adult foot. Although they function separately, there is an indirect relationship. If the toes are pulled back toward the face, the plantar fascia tightens up. This position is very painful for someone with plantar fasciitis. Force generated in the Achilles' tendon increases the strain on the plantar fascia. This is called the windlass mechanism. Later, we'll discuss how this mechanism is used to treat plantar fasciitis with stretching and night splints. 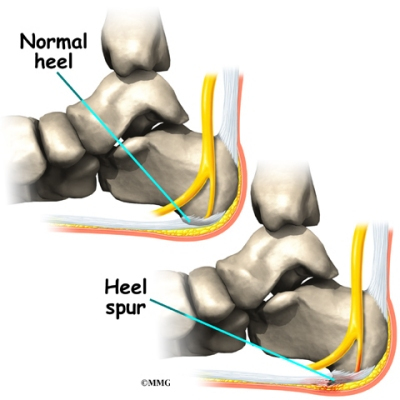 As this process of injury and repair repeats itself over and over again, a bone spur (a pointed outgrowth of the bone) sometimes forms as the body's response to try to firmly attach the fascia to the heelbone. This appears on an X-ray of the foot as a heel spur. Bone spurs occur along with plantar fasciitis but they are not the cause of the problem. Other factors that may contribute to the development of plantar fasciitis include obesity, trauma, weak plantar flexor muscles, excessive foot pronation (flat foot) or other alignment problems in the foot and/or ankle, and poor footwear. The symptoms of plantar fasciitis include pain along the inside edge of the heel near the arch of the foot. The pain is worse when weight is placed on the foot especially after a long period of rest or inactivity. This is usually most pronounced in the morning when the foot is first placed on the floor. This symptom called first-step pain is typical of plantar fasciitis. The diagnosis of plantar fasciitis is generally made during the history and physical examination. There are several conditions that can cause heel pain, and plantar fasciitis must be distinguished from these conditions. Pain can be referred to the heel and foot from other areas of the body such as the low back, hip, knee, and/or ankle. Special tests to challenge these areas are performed to help confirm the problem is truly coming from the plantar fascia. An X-ray may be ordered to rule out a stress fracture of the heel bone and to see if a bone spur is present that is large enough to cause problems. Other helpful imaging studies include bone scans, MRI, and ultrasound. Ultrasonographic exam may be favored as it is quick, less expensive, and does not expose you to radiation. What can be done for my pain? Most patients get better with the help of nonsurgical treatments. Stretches for the calf muscles on the back of the lower leg take tension off the plantar fascia. A night splint can be worn while you sleep. The night splint keeps your foot from bending downward. It places a mild stretch on the calf muscles and the plantar fascia. Some people seem to get better faster when using a night splint. They report having less heel pain when placing the sore foot on the ground in the morning. There have been a few studies that reported no significant benefit from adding night splinting to a program of antiinflammatory meds and stretching. Other studies report the benefits of short-term casting to unload the heel, immobilize the plantar fascia, and reduce repetitive microtrauma. Supporting the arch with a well fitted arch support, or orthotic, may also help reduce pressure on the plantar fascia. Placing a special type of insert into the shoe, called a heel cup, can reduce the pressure on the sore area. Wearing a silicone heel pad adds cushion to a heel that has lost some of the fat pad through degeneration. Botulinum toxin A otherwise known as BOTOX has been used to treat plantar fasciitis. 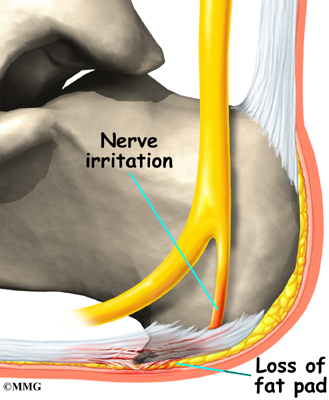 The chemical is injected into the area and causes paralysis of the muscles. BOTOX has direct analgesic (pain relieving) and antiinflammatory effects. In studies so far, there haven't been any side effects of this treatment. 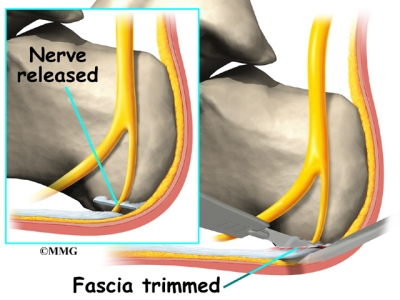 Surgery usually involves identifying the area where the plantar fascia attaches to the heel and releasing the fascia partially from the bone. If a small spur is present this is removed. The small nerves that travel under the plantar fascia are identified and released from anything that seems to be causing pressure on the nerves. 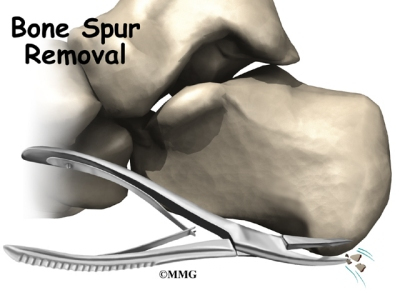 This surgery can usually be done on an outpatient basis. This means you can leave the hospital the same day. Nonsurgical management of plantar fasciitis is successful in 90 per cent of all cases. Patients with plantar fasciitis are commonly prescribed physical therapy. Therapists design exercises to improve flexibility in the calf muscles, Achilles' tendon, and the plantar fascia. Treatments directed to the painful area help control pain and swelling. Examples include ultrasound, ice packs, taping, and soft-tissue massage. Therapy sessions sometimes include iontophoresis, which uses a mild electrical current to push anti-inflammatory medicine to the sore area. A customized foot orthotic may be designed to support the arch of the foot and to help cushion the heel. Or your therapist may recommend you use a heel cup. Healing is fostered by off-loading the plantar fascia and allowing it time to heal without daily (repeated) microtrauma. The pressure of the cup or orthotic against the skin may also interrupt sensory input and pain messages going to the brain. Ideas are offered for you to use at home, such as doing your stretches for the calf muscles and the plantar fascia. You may also be fit with a night splint to wear while you sleep. As mentioned earlier, the night splint is designed to put a gentle stretch on the calf muscles and plantar fascia as you sleep. Many times it takes a combination of different approaches to get the best results. There isn't a one-size-fits-all plan. Some patients do best with a combination of heel padding, medications, and stretching. If this doesn't provide relief from symptoms within four to six weeks, then physical therapy and orthotics may be added. There is some evidence that an orthotic in the first few weeks after symptoms appear followed by stretching is an effective approach. It will take several weeks before the tissues are well healed. The incision is protected with a bandage or dressing for about one week after surgery. You will probably use crutches briefly, and a physical therapist may be consulted to help you learn to use your crutches. 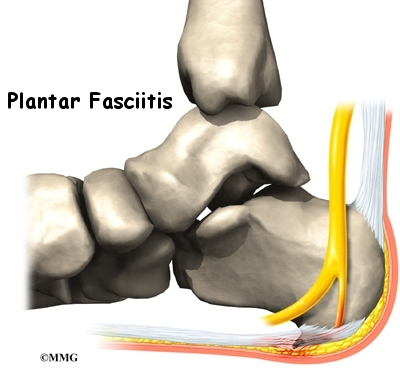 Surgical release of the plantar fascia decreases stiffness in the arch. But it can lead to collapse of the longitudinal (lengthwise) arch of the foot. 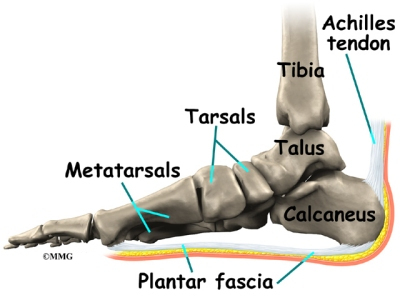 Releasing the fascia alters the biomechanics of the foot and may decrease stability of the foot arch. The result may be increased stress on the other plantar ligaments and bones. Fractures and instability have been reported in up to 40 per cent of patients who have a plantar fasciotomy.